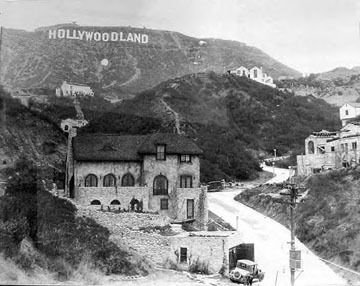 The original sign, HOLLYWOODLAND, was an advertisement for housing development in the 1920s. In 1923, real estate developers advertised a new community in the hills above Hollywood, California. The housing development – Hollywoodland – was minutes away from more expensive properties in the Hollywood district of Los Angeles. Dedicated on July 13, 1923, the HOLLYWOODLAND Sign was built, according to developers Woodruff and Shoults, to attract people to live in a “superb environment without excessive cost on the Hollywood side of the hills”. The expected life of the ad, which cost about $21,000 (roughly $250,000 today) was about 18 months. The 30-feet wide and 50-feet high letters, adorned with nearly 4,000 light bulbs, was a significant attraction, and the Sign soon became an internationally recognized symbol. In the beginning, the Sign’s lights would flash in segments: HOLLY / WOOD / LAND, then the entire “HOLLYWOODLAND” would light up. By the mid-1940s, the neighborhood saw the now-deteriorating Sign as an eyesore and wanted it removed. The land developers opted to sell the remaining 450 acres, including the Sign, and turned it over to the City of Los Angeles. In 1949, the Hollywood Chamber of Commerce worked with the Los Angeles Parks Department to repair the Sign. “LAND” was removed so the Sign would reflect instead the entire district of Hollywood, and, since electrical costs would be the Chamber’s responsibility, the light bulbs were neglected. By the early 1970s the first O splintered and the third O had fallen off entirely. The Sign now read “HuLLYWO D”. A 1973 makeover lasted but five years as the unprotected wood and sheet metal continued to weather. Today, the Hollywood Sign’s letters stand 45-feet tall and range from 31- to 39-feet wide. In 1978, Hugh Hefner hosted a gala to raise money for complete restoration of the landmark. Nine donors, including Hefner, Alice Cooper, Gene Autry and Andy Williams, donated $27,700 each. The old Sign was taken down, and the new letters, which took three months to construct, were made of quality steel, and stood 45-feet tall. Since then, the typical maintenance consists of painting. The original 1923 Sign was purchased from the Chamber by a private citizen and was later auctioned on eBay. In the early ’40s, the Sign’s caretaker destroyed the H when he lost control of his vehicle. In January, 1976, following the passage of a state law decriminalizing marijuana, the Sign was altered to read “HOLLYWeeD”. In April 1977, the Sign was altered to read “HOLYWOOD” for the Easter Sunrise service. In 1978 the Sign was altered again to read “HOLYWOOD” for Pope John Paul II’s visit. The Sign’s H was covered in July 1987 to read “OLLYWOOD” during the Iran-Contra hearings. The Sign also holds some tragic history. In 1932, a New York stage actress named Peg Entwistle, became known as “The Hollywood H Girl” after she climbed 50 feet up a workman’s ladder to the top of the “H” and then fell to her death. Today, the Hollywood Sign is protected via distinct legal rights. 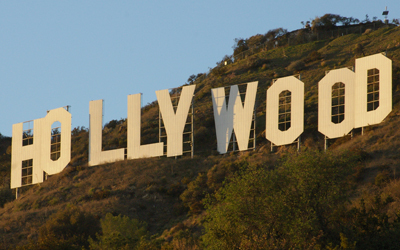 In 1992, California’s Attorney General granted rights and responsibilities to three parties: The City of Los Angeles (which owns the land), the Hollywood Chamber of Commerce (which owns licensing rights for the Sign’s image) and Hollywood Sign Trust (an organization formed to maintain, repair and make improvements to the Sign). While the Chamber has, in unique circumstances, allowed approved alterations of the Sign’s image, both the physical and Sign and it’s likeness is protected under law and licensing. Due to it’s popularity, the Sign is monitored 24-hours a day. Aside from patrols, a security system consisting of both closed-circuit and Internet-based surveillance is used to prevent damage and ensure safety in the area. The public can watch two web cams positioned at the front and back of the Sign at The Hollywood Sign web site. Large investments have been made to ensure the whole landscape remains unchanged. In the late 2000s, concerns about potential real estate development in the Sign’s area called for The Trust for Public Land to sign an option to purchase the 138 acres for $12.5 million. A large banner reading “SAVE THE PEAK” covered the HOLLYWOOD Sign as part of a fundraising campaign. Hefner donated the final $900,000 necessary and the land became an extension of Griffith Park. The efforts made means tourists and locals alike will be able to appreciate the nostalgic view for many years to come.